Andy Wyenandt discusses his powdery and downy mildew fungicide screening study. Andy Wyenandt continues to evaluate new breeding material and varieties for tolerance and chemical controls for Phytophthora. You will be able to view these plots. This is becoming a serious disease in New Jersey. Andy Wyenandt will discuss the results from this year’s studies. 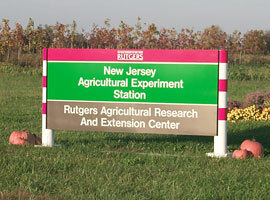 Tom Orton continues to work on the project to develop tomato varieties for early production under New Jersey conditions. Some of the early results will be demonstrated. Maurice Sheets, Woodland Produce, had a Sustainable Agricultural Research and Extension Grant to study fig production in high tunnels. He will report his results.